After my many posts alluding to kefir (Fermented Fun, Getting More Gut Flora etc) and my many recipes involving homemade yogurt or whey, that it was time to explain myself! Kefir (pronounced either ke-fear or kee-fer ), meaning to froth or foam, is of Turkish origins. It is basically a natural probiotic (i.e. alive bacteria) substance you can use in either milk or water, and the bacteria will feed on the available sugars and multiply. Granted, eating multiplying bacteria does not sound particularly appealing but bear with me, it really is a cheap and beneficial addition to your diet! 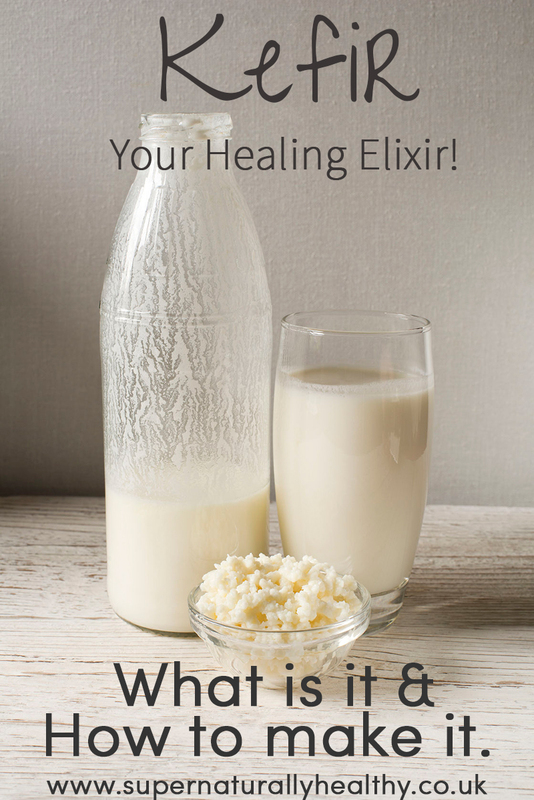 In fact, I would go far to say that kefir is a healing elixir for the body. My one2one clients or those on my Flourish eCourse often rave about how much better they feel from just adding some kefir to their days. I am going to focus today on milk kefir as that is what I use and even lactose intolerant people tend to get on fine with it. In the future, I hope to introduce water kefir and kombocha. With these you can make a fizzy soda or tea-based drink (it produces amazing ginger beer, but it gave me gas so I need to wait until my body is a bit more healed and happy before introducing it again as it tends to be a more intense probiotic than diary). Why should I include it into my diet? It is a very potent probiotic. 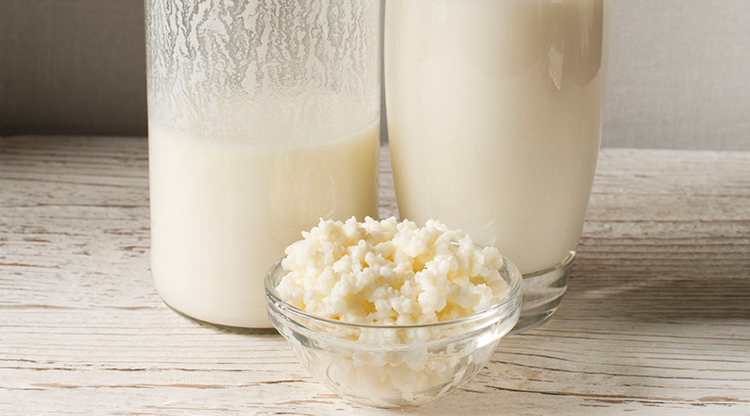 There are many benefits of kefir, but the main one is the probiotic, living element. As previously discussed (here and here) probiotics are essential for good gut and digestive functioning yet it is something our modern diets tend to be void of due to our reliance on pre-made sterilized foods. So for all of you who suffer from IBS or any other type of bowel or digestive problems (flatulence anyone?) then introducing kefir into your diet could do wonders. Kefir is rich in calcium, vitamin K (needed for blood clotting), wound healing and calcium distribution (therefore preventing osteoporosis). It also includes various B vitamins including Biotin which is a B vitamin that actually helps your body assimilate various B vitamins, which helps the body’s metabolic process and therefore, contributes to our energy levels. Because all the proteins and vitamins in kefir are already in a living bacterial environment they are already partially broken down and therefore easy for the body to assimilate, making it an easy to digest and a gentle addition to top up your diet. The good bacteria also plays a role in the digestion of food, as it lines the intestine wall and helps with the digestion of starches/sugars. If you lack these bacteria then food can rot in your gut which can cause flatulence, cramps/spasms, bloating, diarrhea and it encourages further bad bacteria growth. Interestingly, there has been much talk of the root of constipation being primarily a lack of good probiotics in the gut as they line the gut and help food to pass through easily. Surprisingly this humble product helps you to sleep and relax. It contains the amino acid tryptophan which helps promote sleep and rest and can ease symptoms of depression. Including kefir into your diet can help boost and maintain a strong immune system. This is because they cover the gut, they act like a line of defense for our blood stream to prevent any foreign substance entering in. So a diet that is rich in probiotics supports your immune system, meaning it doesn’t have to work over-time and pick up the slack of a poor gut. Well first there are two types of kefir you can get: grains or strains (it rhymes). And although I will give you some rough guidance below if you buy any of the strains or gain you will get complete instructions on how to make it with that specific strain. Fermenting anything is a mix of science and art – it’s hard to get it massively wrong as long as you remember to use sterile equipment and are always feeding the bacteria, which in this case your feeding it with the lactose from the milk. Are like mini cauliflower-type blobs that you put into your milk and then strain out once you are done. I call them kefir babies as they need constant feeding and attention. If you forget about them they rot and die. They also grow and multiply so you can create your own kefir baby making factory and find yourself constantly asking people if they ‘would like some of your grains’ (sounds like a weird euphemism). Get the grains here. As mentioned follow the instructions you get with the grains. Recipe – for kefir grains. 500ml organic ideally raw milk – always full fat! Place the above in a clean sterilised jar and cover with a muslin cloth or half undone lid. Place in a warm environment and leave for 2-4 days. Then strain through a PLASTIC sieve (the grains don’t like metal) remove the grains and place into fresh milk immediately. Options– straining kefir further through a muslin cloth hanging over a bowl to create a thicker yogurt or eventually cream cheese!! This is my preference as I find it less high maintenance in comparison to the grains. When you buy or get given a strain of kefir you basically have to mix it at roughly 1 strain to 5 milk ratio, leave it for 12-48 hours and then make sure that you don’t eat all of it so you can make the next batch. Once my kefir is made I then choose to strain it to get curds and whey, as I prefer a thicker yogurt to eat or make desserts with, and the whey I use for a million things but mainly for probiotic protein smoothie making (no chemical whey powders for me). Once my kefir is made I then choose to strain it to get curds and whey, as I prefer a thicker yogurt to eat or make desserts with, and the whey I use for a million things but mainly for probiotic protein smoothie making (no chemical whey powders for me). Also the plus is if I go away for 2 weeks I can just keep the whey in the fridge (it lasts for 3 months if kept cold) and when I come back I can happily start making kefir again, whilst when I used the grains I had to take them with me everywhere and feed them – hence the name of kefir babies! This is a strain you can use and it produces a more yogurty kefir. I literally just pour whole organic milk into a large jar and add some of the previous batch and leave for 24 hours, then do the same again. The only down side with strain is that they might not last as long you may need to refresh your strain by buying a new one every 2-3 months. Place the above in a clean sterilized jar and cover with a muslin cloth or half undone lid. Place in a warm environment and leave for 2-4 days. Then consume but you MUST ensure you leave 200ml in order to make another batch. (Don’t eat it all at once!! You may find once you get going you can use less kefir to start the next batch and you can make large amounts in one go – I used to make about one litre at a time. I notice a massive difference when using kefir in my diet, my stomach is calmer, flatter and far more comfortable. Even though I am avoiding most sources of lactose (milk, shop yogurt, chocolate and soft cheese) I find it in no way makes me feel mucousy or gives me any skin eczema problems. Go slow – don’t down a whole pint full at first start with a few tbsp and then build up gradually. If you are still confused there are load of great online tutorials and guide. All strains that you buy online will come with instructions, but feel free to ask me any questions you have over at my Facebook page. Or if you dealing with digestive issues that won’t seem to go away no matter what you do then click here to find out more about my one2one consultations where we would work on getting you healed and healthy from the inside out! 2. Nourishing Traditions by Sally Falon – general reference.